Mashes up one of the most expensive figures from the vintage line with the legendary bounty hunter figure toy that we were promised but never got. Rocket really fires!! Clam shell packaging so you can shoot your eye out. Hand cast 3.75″ carded figure. Signed and numbered edition of 10. 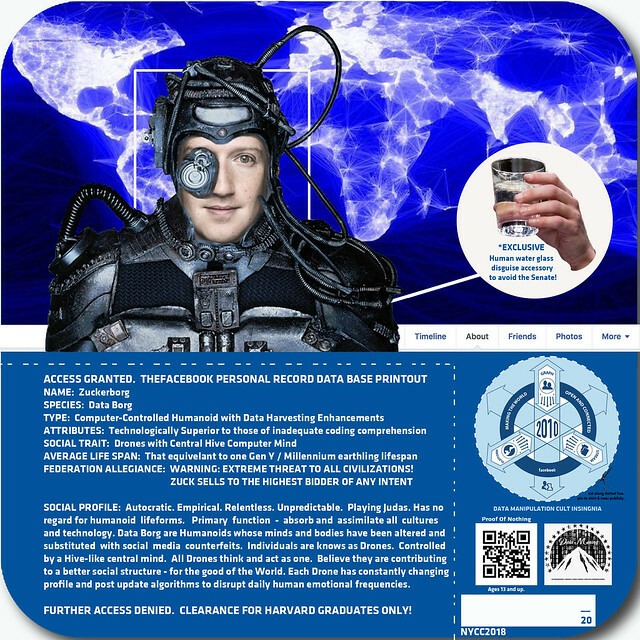 Bio: John Pryor better known as Dollar $lice Bootlegs is a yeti on acid. Hailing from Carmel Valley, CA, John Pryor improves the planet one toy at a time with a heavy leaning towards fun. He’s also a great cook. 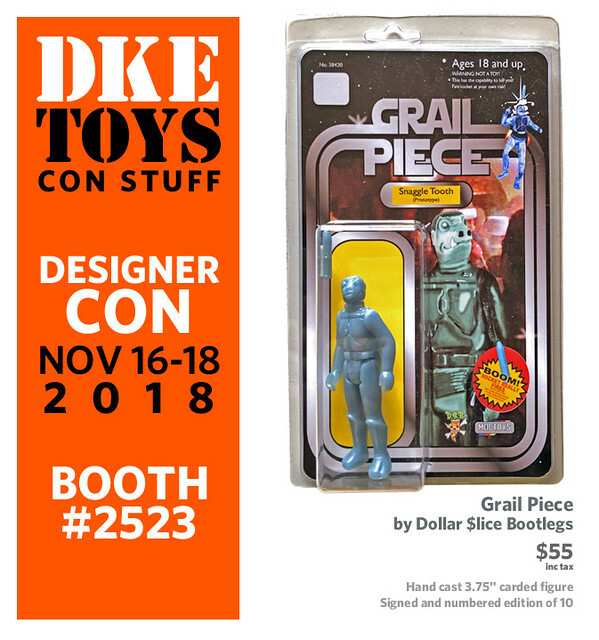 This is the first time Ryan Snapp of Snapp Fink Toys is showing with DKE. 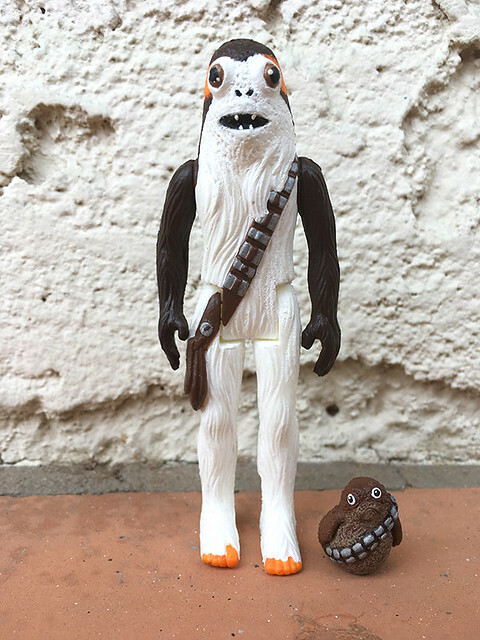 Hand cast and painted 3.75″ carded figure. Signed and numbered edition of 10. Bio: Ryan Snapp is a Sonoma County based Artist/ Illustrator. He loves using his imagination to create wacky characters and Illustrations. His sense of humor often comes across in his work. Not only does Ryan enjoy drawing and painting he also enjoys creating special effects makeup and custom carded action figures. Ryan is a major horror movie fan and an avid toy collector. 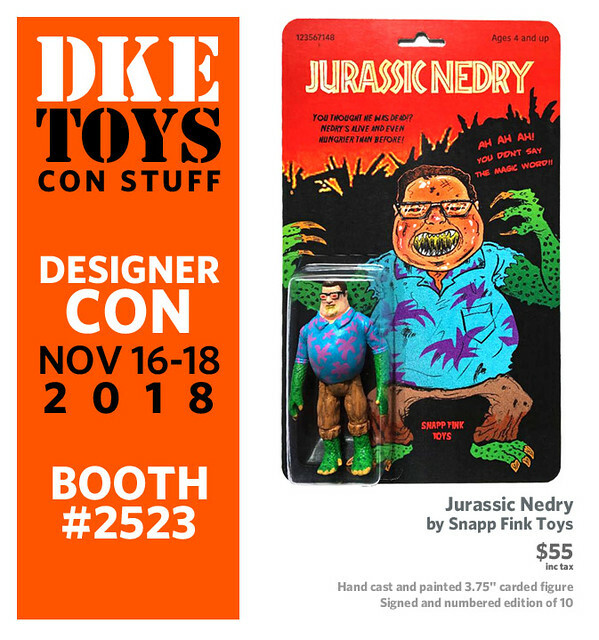 This is the first time Ryan Snapp of Snapp Fink Toys is showing with DKE. 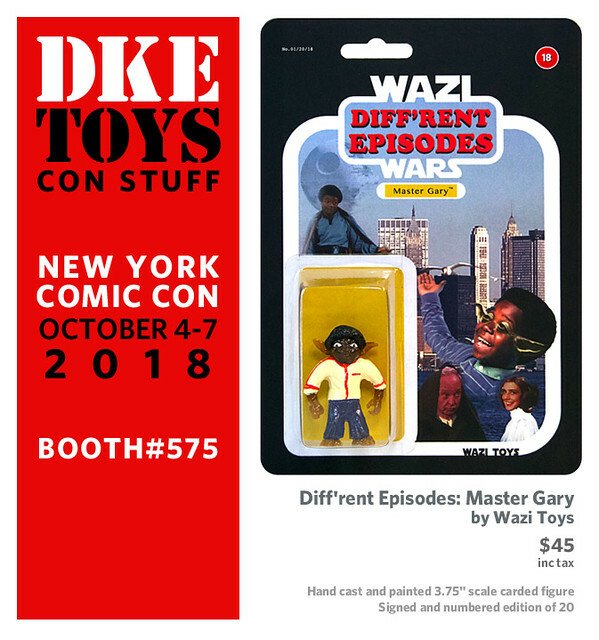 Here she is, the follow up to NYCC’s Master Gary. 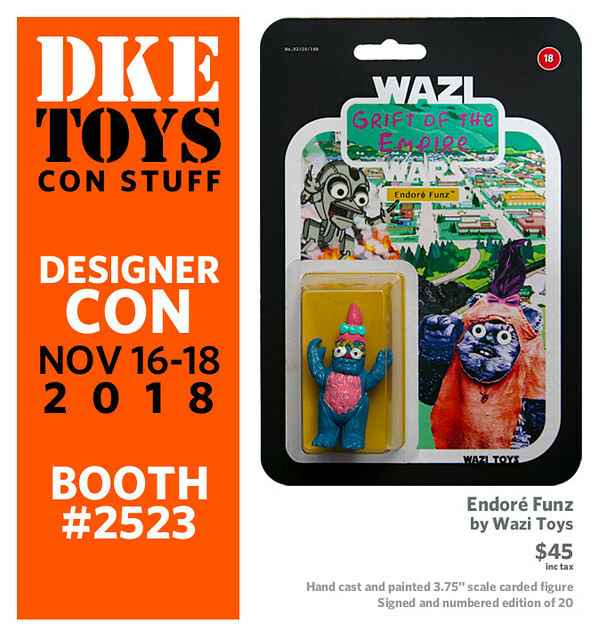 Wazi toys presents Endoré Funz. This fury creature is a actually a mash up of a favorite fuzzy galactic critter and a citizen of Springfield. This piece was supposed to be one of a larger edition but Wazi spent so much money on gold leaf that this will likely be the only one. We like it over here when people get political and this one really delivers. 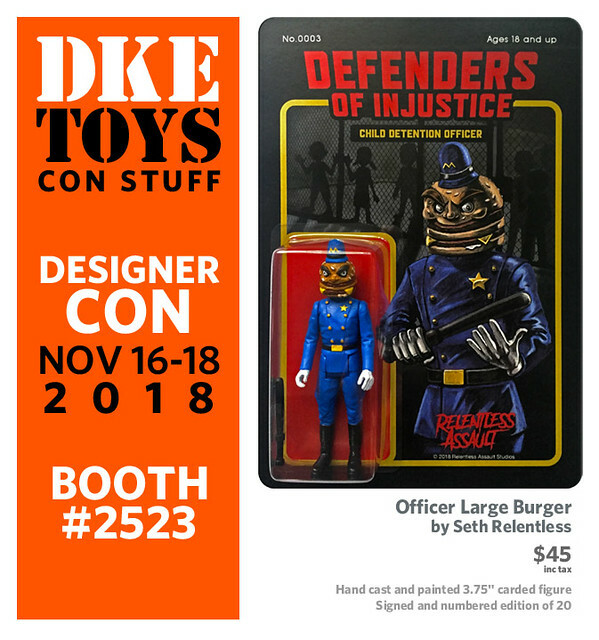 Seth Relentless previously released a few rock and roll mash up pieces, but Officer Large Burger has that punch you in the gut kind of feel to it. 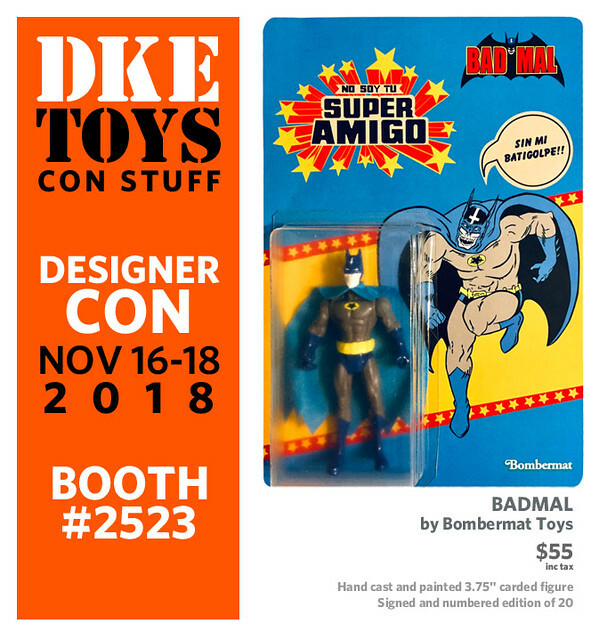 Bombermat is back with DKE again for DCON this year. Matias Bomber from Argentina made BADMAL. Great vintage style super hero card back. 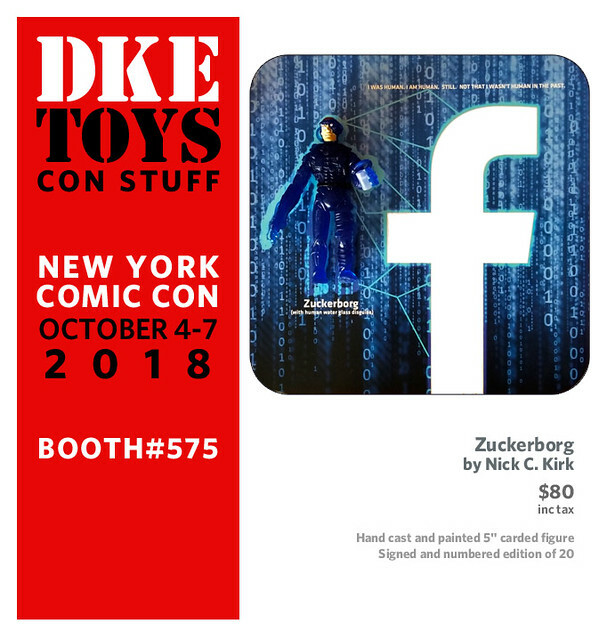 Dov is on Toy Geeks sharing all the NYCC STUFF!!!! 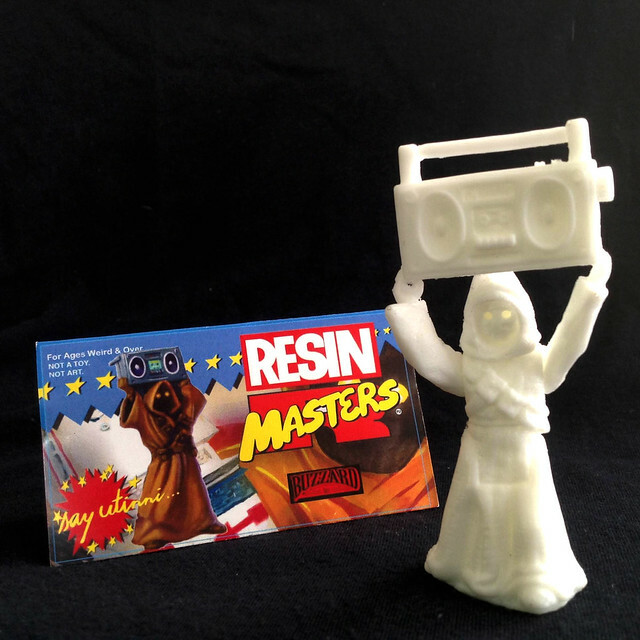 This is a continuing series of RESIN MASTERS to go into your RESIN MASTERS carrying case. 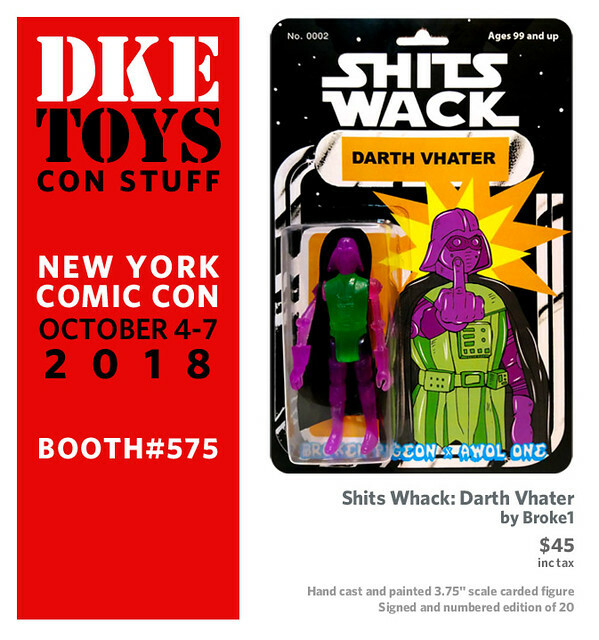 Last year we sold out of the Say Utinni piece so we thought it fitting that Buzzard Guts would bring it back to New York. 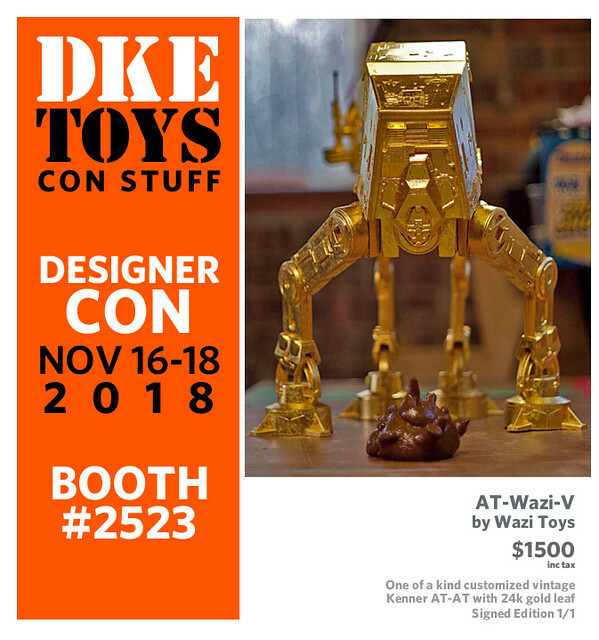 3.75″ scale and Say Utini is $25. 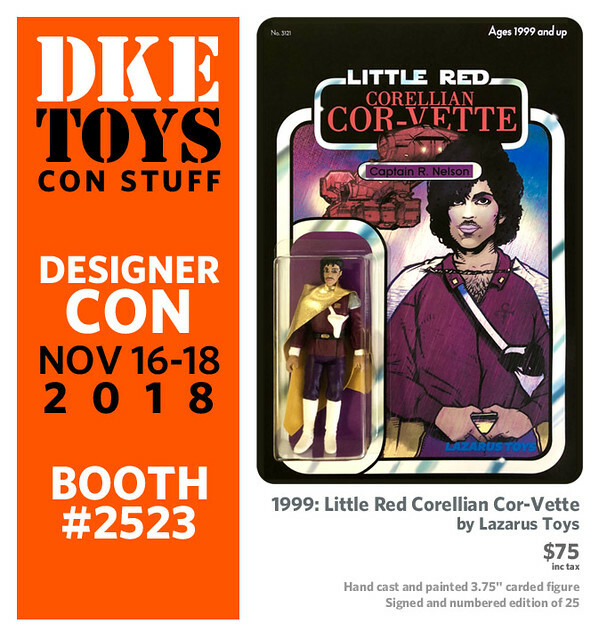 If you can’t make it to NYCC please email dketoys@gmail.com to be placed on a waitlist for any leftovers after the show. This is a continuing series of RESIN MASTERS to go into your RESIN MASTERS carrying case. 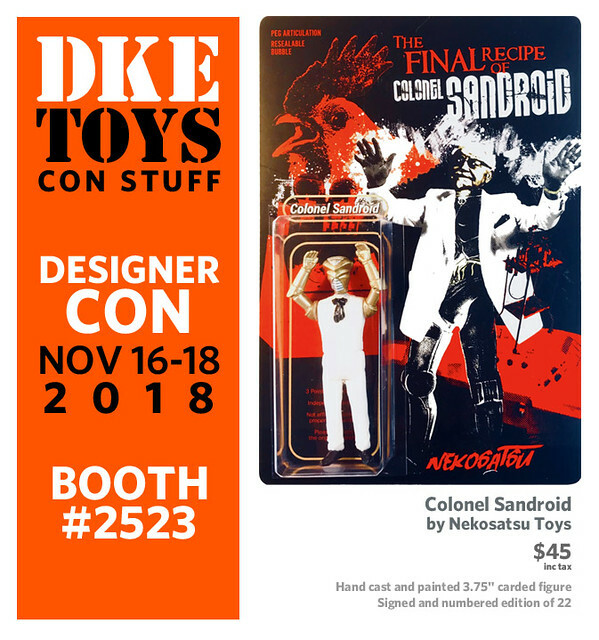 Janky Toys is adding to his ever popular Severed Limbs series. 3.75″ scale. Severed Limb only $15. 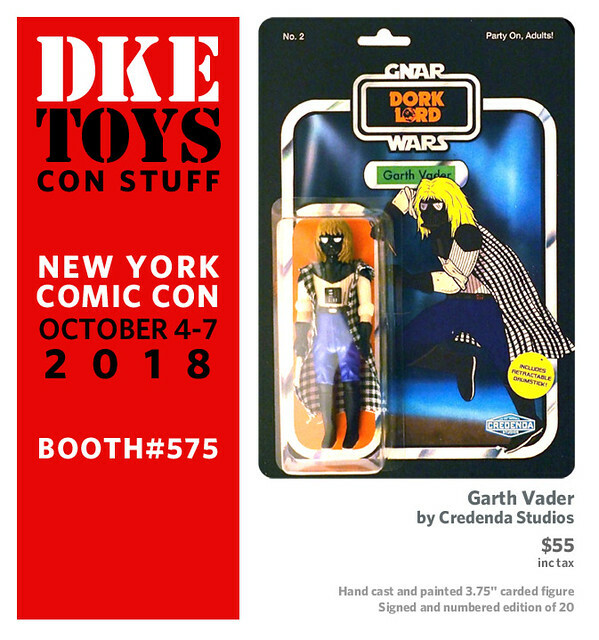 Credenda Studios’ Beau Greener is back again this year with Garth Vader. A playful play on words. Our favorite psuedo rock star comedian mashed up with the dark father. Signed and numbered edition of 20.Beau did the card art too. 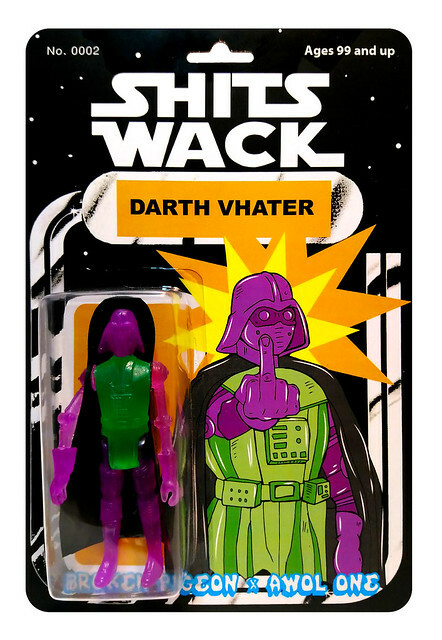 Broke1 aka Broken Pidgeon aka Brody Kreps aka Brandon has restarted his infamous Shits Whack series with the first installment entitled Darth Vhater. Edition of 20. Hand made 3.75″ scale. $45 tax included. $75 inc tax. Hand cast and painted 3.75″ scale carded figure set. On metal cardback.Signed, sketched and numbered edition of 30. $45 inc tax. 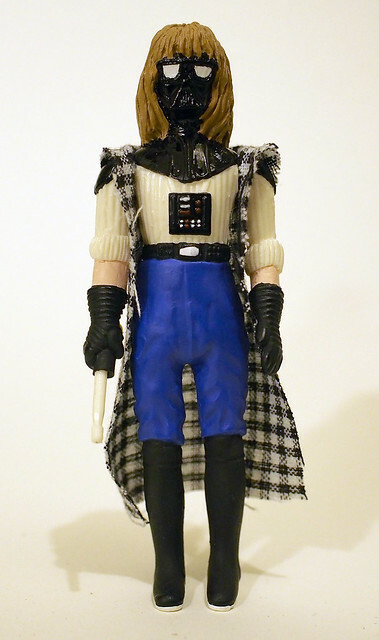 Hand cast and painted 3.75″ scale carded figure. Signed and numbered edition of 20. $80 inc tax. Hand cast and painted 5″ carded figure. Signed and numbered edition of 20 that includes 3 versions. Bio: Nick works in an array of traditional and contemporary methods of drawing, sculpting, printmaking, painting, installation and interactive works which push the boundaries into contemporary mediums. 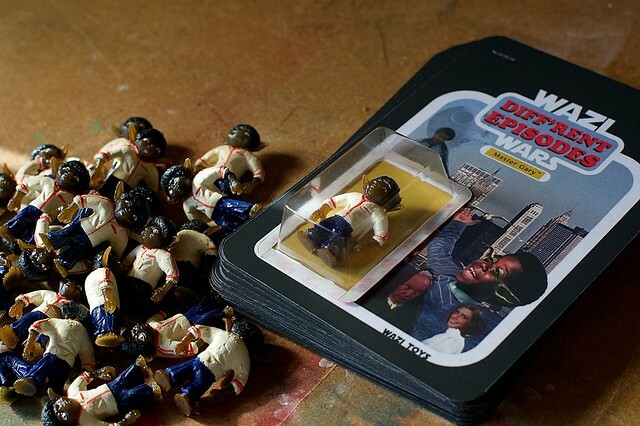 Visually, Nick’s work is anything but traditional, as he juxtaposes imagery from mass-production, the world of advertisement, and pop-culture. Sometimes he draws his visual language from the commercials preserved in childhood nostalgia or ripped from the 24-hour news cycle. He uses scale and contradiction as a means to highlight opinions that often go unquestioned. Nick seeks to deliver an experience that engages his audience with a dose of cynicism sprinkled with irony and taken with a spoonful of humor. 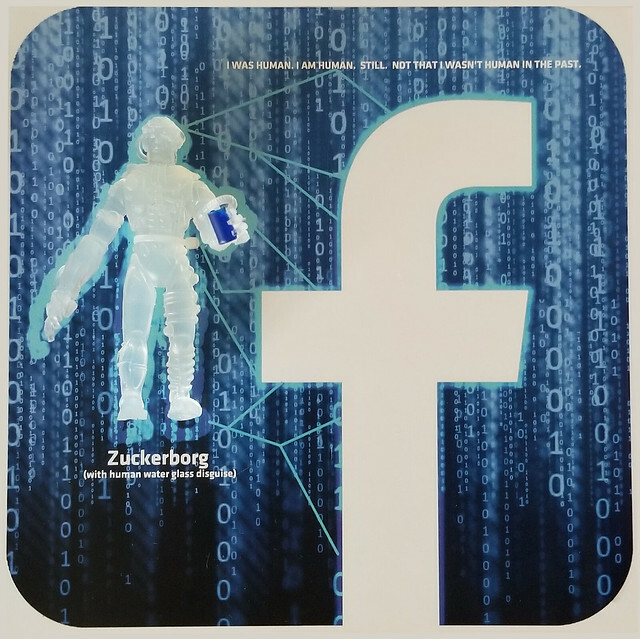 In the end Nick asks the audience to question the status quo of society – to confront the compliance of culture and current affairs, and he uses the vibrant mass-media visual aesthetic to do so. $20 inc tax. 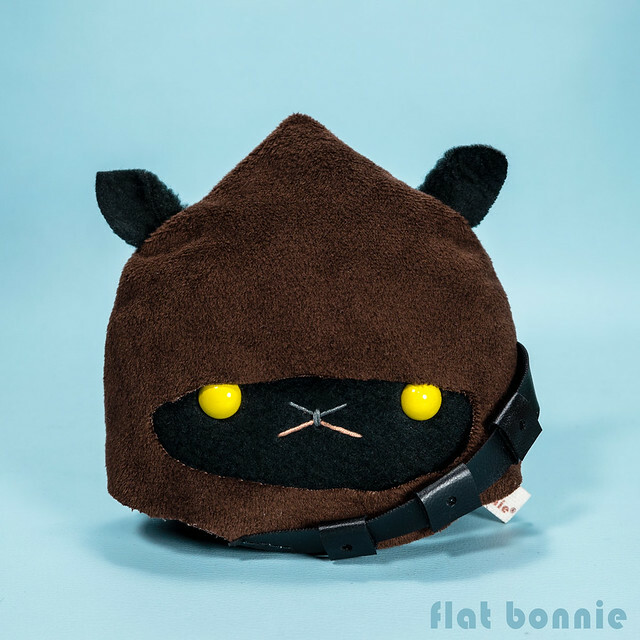 Hand made 5″ fleece and vinyl pleather plush. Signed and numbered edition of 50. 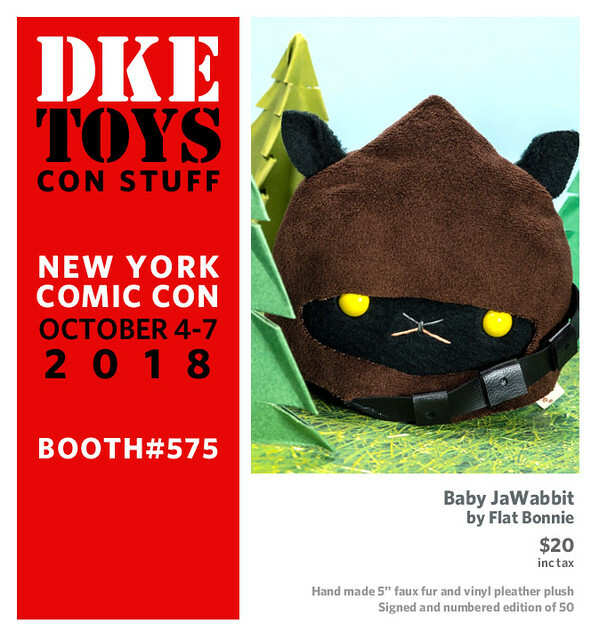 Flat Bonnie helps raise awareness of abandoned animals, and the importance of adopting when you are ready for a new friend. A generous portion of sales is donated to bunny/animal rescue organizations monthly. 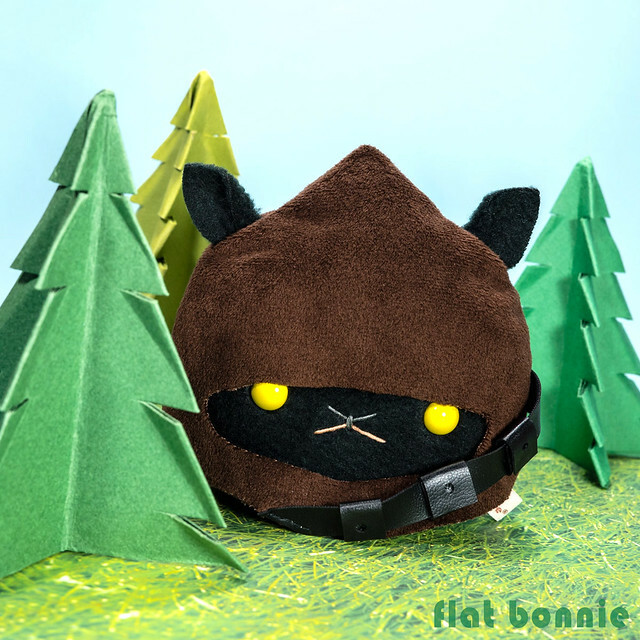 Flat Bonnie plushes are made with 100% animal friendly products. $45 inc tax. Hand cast 3.75″ scale carded figure. Signed and numbered edition of 30. 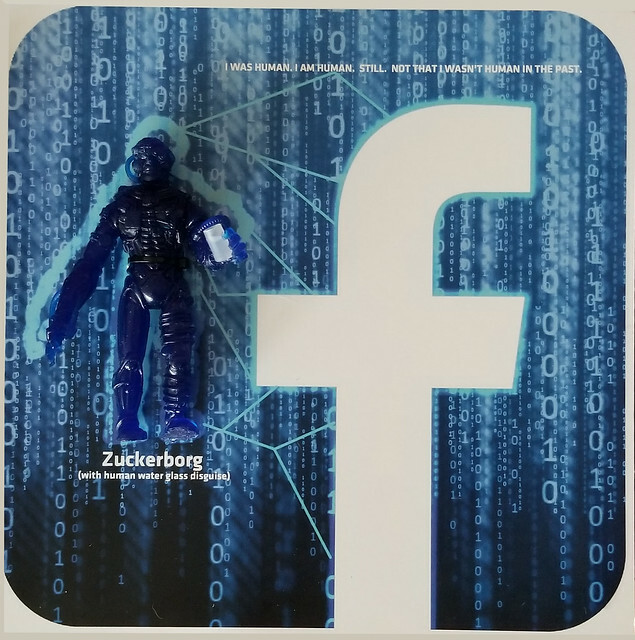 Bio: Buzzard Guts was founded in 1994 as a hand distributed “fan” zine by self proclaimed “artist” and multi-dimensional guru Dain A. Marx who has been creating and exploring alternate universes since the early 70s. Now, Buzzard Guts produces kit bashed hand cast resin figures from a trailer in the woods. 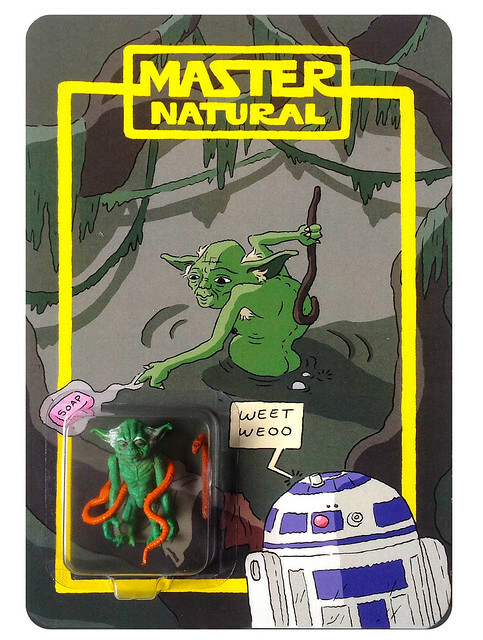 These “bootleg toys” of characters from alternate realities feature collaborations from various talented illustrators like Neil Devlin of Last Boss Comics, Ryan Winn of Valiant Comics and maybe one day, you! Meet Cyanoid. 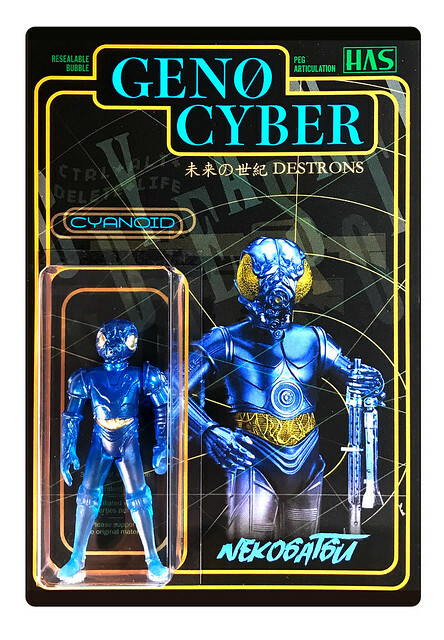 The next figure in the Geno Cyber line by Nekosatsu Toys. $45 inc tax. Hand cast and painted 3.75″ scale carded figure. Signed and numbered edition of 22. Dov has been collecting this guys stuff for a while. In fact he said Dov was his first customer. After he expressed interest in doing an exclusive with us we spoke on the phone and it turns out Henry Zack is 17 years old and going to attend art school next year.